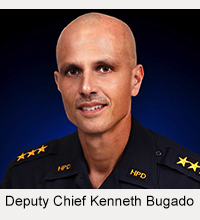 Big Island police have charged two men and a woman with a variety of crimes, including firearms and narcotics offenses, following an investigation of a reported armed robbery. On Sunday (April 17), two Kona men reported to Kona patrol officers that on Thursday (April 14), while they were in their pickup truck with two male acquaintances, one of the acquaintances brandished a handgun, threatened the victims and forced them to hand over their personal belongings. The acquaintances then forced the victims to drive to an undisclosed location, where they took their truck. Detectives from the Area II Criminal Investigation Section continued the investigation and were able to identify 34-year-old Kali Laulea of California as one of the suspects. Police issued an all-points bulletin for Laulea, believing him to be armed. On Tuesday (April 19), officers observed Laulea to be a passenger in a sports-utility vehicle being driven by 24-year-old Katrina Denison of Captain Cook on the Keāhole Airport Access Road. 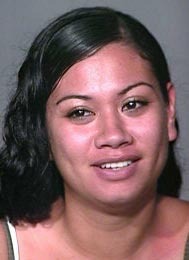 Police conducted a traffic stop on the SUV and arrested Laulea for the robbery without incident. At that point, the officers observed a sedan traveling toward them in an unsafe manner that nearly caused the car to run off the road. Officers conducted a traffic stop on the car, which was occupied by 27-year-old Viliami Tafea of Nevada and 23-year-old Sialeataonga Laulea of California. After developing additional information, officers prepared search warrants for both vehicles. On Wednesday (April 20), Area II Vice Officers served the search warrant on the SUV that had been occupied by Kali Laulea and Denison and recovered a loaded firearm, several rounds of unspent ammunition, 0.6 grams of marijuana, a marijuana smoking pipe and items belonging to one of the robbery victims. 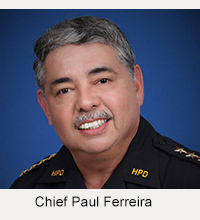 That same day, Area II Vice Officers served the search warrant on the car that had been occupied by Sialeataonga Laulea and Tafea and recovered approximately one pound of cocaine with a street value of $25,000 and 2 grams of marijuana. 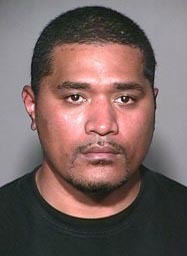 After conferring with prosecutors, detectives charged Kali Laulea with attempted first-degree promotion of a dangerous drug, attempted drug paraphernalia, promoting detrimental drugs, place to keep (pistol), two counts of place to keep (ammunition), two counts of ownership prohibited and carrying a loaded firearm on a public highway. His bail was set at $162,500. Katrina Denison was charged with attempted first-degree promotion of a dangerous drug, attempted drug paraphernalia, promoting detrimental drugs, place to keep (pistol), two counts of place to keep (ammunition) and carrying a loaded firearm on a public highway. Her bail was set at $23,250. Viliami Tafea was charged with first-degree promotion of a dangerous drug, drug paraphernalia, promoting detrimental drugs and driving without a license. His bail was set at $12,200. All three are being held at the Kona police cellblock pending their initial court appearance on Monday (April 25). 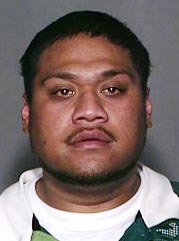 Sialeataonga Laulea was released without charges pending further investigation. Police are continuing their search for a man identified as Laulea’s accomplice in the robbery.